Hanover, June 21, 2016. Since the start of May, the leading technology company Continental has a new head of the business field Original Equipment Truck Tires worldwide. 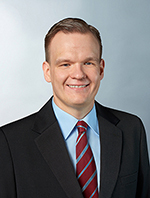 Klaus Kreipe holds this position as Vice President and manages the business field from Hanover-Stöcken. In his new role, he reports directly to Andreas Esser, Executive Vice President and head of Continental's Commercial Vehicle Tires business unit. Mr. Kreipe succeeds Peter Matzke, who has retired after almost 40 years working in different functions at Continental. Klaus Kreipe, new head of Truck Tires Original Equipment worldwide at Continental Commercial Vehicle Tires. Klaus Kreipe has been working for Continental for 15 years, and has spent 12 of these years working at the company's various foreign locations. After studying Mechanical Engineering at the Technical University of Braunschweig, he started his professional career in Research and Development at the Tire Division. This was followed by positions as Plant Manager of ContiTech in Romania, Tire Sales General Manager in China, and Vice President Marketing & Sales in the Asia Pacific region. Most recently, Klaus Kreipe worked as General Manager of the Eurofit Group in Belgium, a joint venture co-founded by Continental for assembling and sequencing passenger car tires.